Hello friends! Today I have a card I made using two of the newly released Our Daily Bread designs sets... Flourished Verses and Faithful Friend. I started off with a base of Bazzill, and then used Alla Prima for my designer paper. I used alcohol inks for the dragonflies but my mixative was dried up so they are not as pretty as they could be, although IRL they are more vivid than in the photo. Anyway... this sketch was from Seems a Little Sketchy . I used Cheery Lynn Italian Doily for my circle element, and also used Spellbinder's Lattice Rectangles, Classic Circles Lg and Classic Scallped Circles Lg. Embellishments include Prima roses, bakers twine, MS bough punched greenery, and some fabby lace give by a sweet friend. You know who you are... and thank you!!! The dragonflies are so beautiful! Blue & Green is my favorite combo when using them. The pop of yellow/gold is awesome! 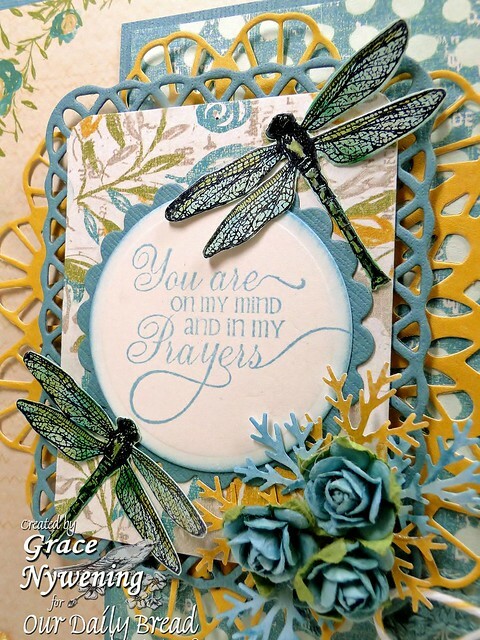 Gorgeous card, Grace! The colors and papers are beatiful and so is the sentiment! The dragonflies look like they are alive and have just alit on your card! Lovely flowers! Have a great weekend -hope the storms steer clear of you! So beautiful & peaceful, Grace! Gorgeous color combo.....hope you are staying safe tonight in the storms. Grace, thank you for sharing such a beautiful creation. I love the new ODB sets! Very pretty. The dragonflies look so real! Hugs! Such a beautiful card. Those dragonflies look so real. Love the double die cuts. grace, this is such a beautiful eye-candy! Absolutely gorgeous Grace! I have such a difficult time using dragon flies but they are perfect here! Thanks for inspiration with this beautiful creation! Thanks so much for joining our "SEEING SPOTS" challenge at Shelly's Images! Please come back and join us again real soon!! Grace, this is beautiful! I love the colors you chose! Simply STUNNING. Love what you created. This is just amazing. Gorgeous colours. Thanks for joining us at Do You Stack Up. What a gorgeous card, Grace! I love how the dragonflies turned out...simply beautiful. Thanks for playing along at Seems A Little Sketchy. Hope to see you back again tomorrow for the newest sketchy challenge! wow this is awesome!! Great job!Thanks for joining us at Delightful Challenges, good luck and hope to see you next time. This is gorgeous Grace.Beautiful colors and love those dies. This is gorgeous! Love the colors and all the delicate details. Thanks for joining us at DYSU. This is just gorgeous and stunning! Thanks so much for playing along with Paperplay this week!! What a breathtakingly beautiful creation! Thanks for joining our "Seeing Spots" challenge at Shelly's Images. Good luck in the draw - hope to see you again in the next challenge! Thanks for sharing this with us at Do You Stack Up! Gorgeous! Oooh- I love this set and this card really shows it off well, Grace! I love your layers...you must have had a lot of holes to poke out of those die cuts. The flowers and the MS boughs look fabulous! And, of course, the dragonflies are darling! I don't know how you were applying the alcohol inks on them...but they are great...And, as far as the sentiment..."You are on my mind and in my prayers"...always! Grace this is gorgeous! 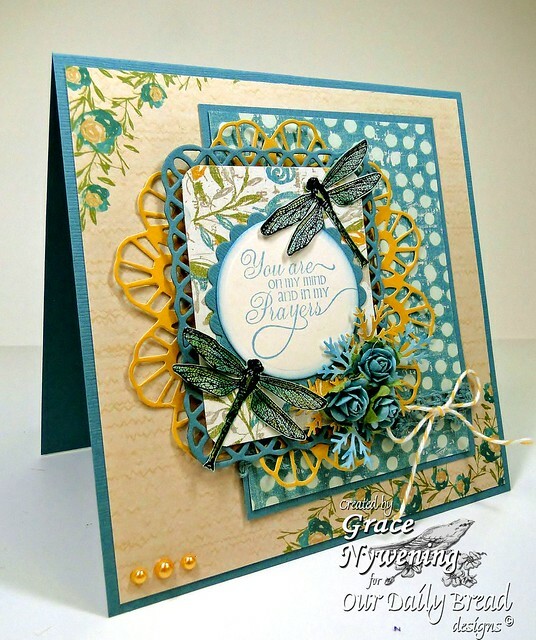 I love the color combo and beautiful layers of your card. Just perfect patterned papers and sweet embellishments. Thank you so much for joining in on our twine challenge this week at Raise The Bar! Congratulations you've been chosen as one of our TOP 5 over at Fussy and Fancy - don't forget to grab your badge! every thing about this card is beautiful.